In the only book to date to explore the period between the 1859 publication of Darwin’s Origin of Species and the discovery in 1900 of Gregor Mendel’s experiments in genetics, John S. Haller, Jr., shows the relationship between scientific “conviction” and public policy. He focuses on the numerous liberally educated American scientists who were caught up in the triumph of evolutionary ideas and who sought to apply those ideas to comparative morality, health, and the physiognomy of nonwhite races. 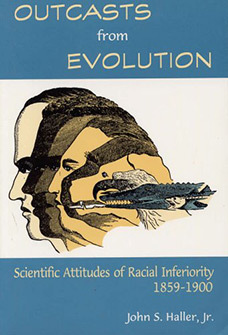 During this period, the natural and social scientists of the day not only accepted without question the genetic and cultural superiority of the Caucasian; they also asserted that the Caucasian race held a monopoly on evolutionary progress, arguing that “inferior races” were no more than evolutionary survivors doomed by their genetic legacy to remain outcasts from evolution. Hereditarians and evolutionists believed that “less fit” human races were perishing from the rigors of civilization’s struggle and competition. Indeed, racial inferiority lay at the very foundation of the evolutionary framework and, remaining there, rose to the pinnacle of “truth” with the myth of scientific certainty. John S. Haller Jr., PhD, is a professor of history at Southern Illinois University at Carbondale, teaching courses in American intellectual history and the history of medicine. He is author of many books and papers. Haller’s current research involves nineteenth- and twentieth-century alternative medical systems. "The Physician and Sexuality in Victorian America (1974) "
"American Medicine in Transition, 1840-1910 (1981)"
"The People's Doctor: Samuel Thomson and the American Botanical Movement, 1790-1860 (2000) "
" The History of American Homeopathy: The Academic Years, 1820-1935 (2005) "